Oh man, undo the belt buckles (brrrp!). One turkey dinner down, one to go. It's Thanksgiving in Canada, where we have the sense to spread out our holidays but not our turkey dinners. A big dinner with friends last night and another tonight with family ensures I'll go searching in the back of my closet for those elastic waist-band khakis. I know, I know. Don't wear white after Labour Day. Well, I'm expanding my fashion sense, not to mention my waistline. 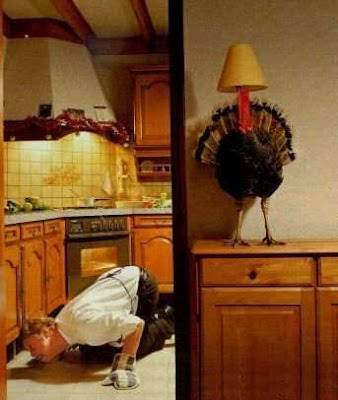 Thanksgiving in Canada occurs sooner than in the States. Ours is the 2nd Monday in October. Theirs is the 4th Thursday in November. What's up with that? Were we faster in bringing in the harvest? Well, no. Actually the first Canadian Thanksgiving was celebrated by explorer Martin Frobisher in 1578. He was looking for the elusive northwest passage, a water route to the Pacific Ocean. He never found it. But he decided to celebrate his survival of a rather arduous expedition. Good on ya Martin. Nice bay they named after ya. Thay, anyone theen the northwest pathage, sweetie? But Thanksgiving in Canada wasn't celebrated on a yearly basis until 1879 and our government didn't proclaim the day a holiday until 1957. In the States, Thanksgiving has been an annual tradition since 1863. The American government saw fit to create a federal holiday in 1941. Nevertheless, together we've managed to keep Butterball in business longer than the Ford Motor Company! (a little bail-out humour there). Apart from eating big turkey dinners this weekend, Canadians settle in to a big double-header of the Canadian Football League. How appropriate. The sad Canadian cousin of the NFL, turkey's an apt description. But it is the time of year to give thanks. What am I thankful for? 1. Entertainment Tonight has finally stopped running Michael Jackson stories. He's D-E-A-D folks, let it go, Mary. 2. Directionless Opposition Leader Michael Ignatieff's non-confidence motion failed to bring down the government, narrowly avoiding an election. Stephen Harper may have a hidden agenda but Ignatieff hasn't any agenda. 3. Late Night with David Letterman tapes in the afternoon. We now know what he does late night. 4. Bob Dylan's issued a Christmas album. Glad tithings of the season. 5. And, oh yes, elastic waist band khakis. I suspect Entertainment tonight are just taking a short break. Jacko has a new single out. It's a trending topic on Twitter, as "New Michael Jackson". PhilH: *runs off, head over ears* AIIIEEEEE!!! I loved learning about Canadian Turkey day and amen to the MJ news...let it die! 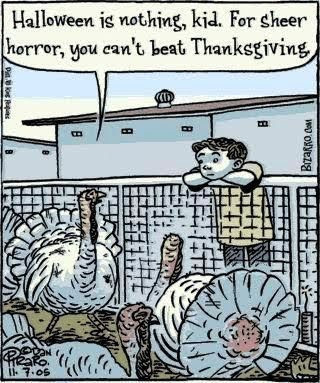 As many turkeys died in Canada recently. I made Vlad a pumpkin pie for his birthday this week and from now on I'm celebrating both Canadian and US Thanksgivings. More pumpkin pie, anyone? Quirks: As I scan the political landscape alas it was turkeys of the animal variety that passed on unfortunately. I think you've got the best of both worlds - celebrate 2 Thanksgivings! Now if Entertainment Tonight would stop with the Jon and Kate stories, we would be all set! BTW, check out my blog today, you funny caption guy, you! Wow, now that I'm aware of Canada's tradition, I wonder how and when Mexico celebrates Thanksgiving? And, speaking of giving thanks, I've given you thanks today over at my place. Kirsten: Oh man ET's stories just go on and on. Aren't ya just sick of Jon and Kate? Me-Me: Hey if it's Columbus Day in the US how come there's no college or NFL games today? I'm stuck watching Canadian football. It blows. 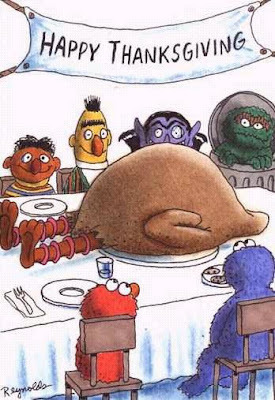 Bert and Ernie came to your Thanksgiving dinner? Damn! Cool! I'm thankful the holidays are not here yet, and I'll be thankful when they're over too. 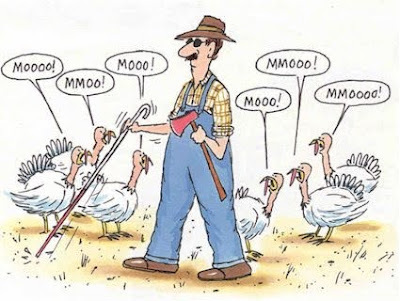 I'm not quite sure why, but the cartoon of the turkeys mooing just about killed me. Martin looks like a very happy guy in that outfit. I bet he found his very own northwest passage...with the help of some of his very close friends. Don: Well not really, but we did have a hell of a big bird! Knucklehead: It's one of my all time favourites, reminds me of Gary Larson. Deb: Martin's attire looks pretty special...as does Martin! I will give thanks this giving that Dylan has finally released a Christmas album. Every artist should have at least one. MikeWJ: Oh, yeah, it's long overdue!